Taking the Train from Ipoh to Butterworth is a nice relaxing way to travel from Ipoh to Penang Island, with the ferry just a short walk from the railway station, taking just 15 minutes to cross over to the UNESCO World Heritage City of George Town. From the ferry jetty on the island you are within five to ten minutes walk of little India and China town, where you will find dozens of places to stay, both cheap and more upmarket. Please Note : This Intercity Train service will be cancelled from the 9th May 2016. From this date all trains from Ipoh to Butterworth will be operated by the new high-speed Electric Train Service (ETS). The new ETS high-speed train service from Ipoh to Butterworth has now started. All the above carriages are Air-conditioned. 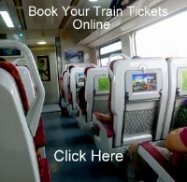 online from the Malaysian Railways website or online train booking agents. There is really not a lot to keep you in Butterworth, unless you want to connect with an early morning train the next day. If you do, there are just a few places to stay. You are much better off jumping on the ferry to George Town which goes every 15 minutes or so during the peak hours of the day. The ferry terminal is just a few minutes walk from Butterworth Train Station. When you arrive at the jetty in George Town, you can either walk into town, grab a taxi or take one of the Rapid Penang buses which are just next to the exit from the ferry. These buses will get you anywhere in the city or out to the beaches at Batu Ferringhi (bus 101). Just ask at the information office in the bus station and they will help you get to where you want in the city or around the island.